Beneath the murky water, a predator lurked. She was old, old enough that she couldn't remember how long she'd been there. Air and water were the same to her, but she preferred the cover and coolness the water gave her. She twisted her fingers and cast out a line of want. Food, she thought. A meal. Several nearby minnows swarmed her but she brushed them away. She wanted something more substantial. The minnows entangled themselves in her hair, which wasn't so much like hair as it was Spanish moss and lichen. A minute later, a large snapping turtle noticed the want, which it perceived to be an injured frog. It followed the line of want back to the witch, mouth open to catch the nonexistent frog. Just as its jaws closed, the frog melted away. The witch reached out and snapped the turtle's neck as easily as it would have broken the bones of the frog. She pulled the shell apart and began to eat. Lion Brand Wool Ease Worsted [86% acrylic, 10% wool, 4% rayon; 197yds/180m per 3oz/85g skein]; color: Mushroom 403, 1 skein. Paton's Allure [100% nylon; 47yds/43m per 1.75oz/50g ball]; color: Emerald 04236, 4 balls. Paton's Brilliant [69% acrylic, 31% polyester; 166yds/151m per 1.75oz/50g ball]; color: Marvelous Mocha 4913, 2 balls. Paton's Divine [79.5% acrylic, 18% mohair, 2.5% polyester; 142yds/129m per 3.5oz/100g skein]; color: Soft Earth 06011, 2 skeins. Hold one strand of each yarn (4 strands total) throughout all directions. Cut 48 strands of fringe 24" long. In 24 strands of fringe, make a slip knot in the center and slip onto one knitting needle. This will become the cast on row. Set aside the other 24 strands. Beginning with a RS row, work 4 rows of stockinette. After the first row, you may want to tighten up all the slip knots and tie a double knot to secure. As desired, insert rows of lace, alternating between the two rows below to prevent the fabric from biasing. 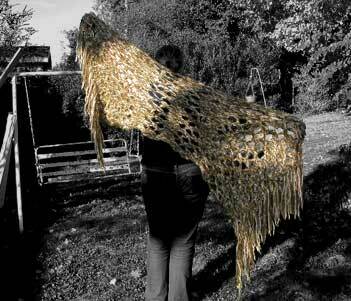 You may complete the shawl entirely in with lace rows, or you can use them sporadically, or not at all. It's your project. Do as you wish. (RS) K1, * yo, k2tog *, repeat from * to last st, k1. (RS) k1, * k2tog, yo *, repeat from * to last st, k1. When you are close to running out of yarn, knit 4 rows in plain stockinette. Insert right needle into the stitch below the 1st st on the left needle. Using a piece of fringe, pull up a loop through this stitch. Drop the 1st st off the left needle and knot the fringe to secure the last two rows. This will not unravel. Repeat across.